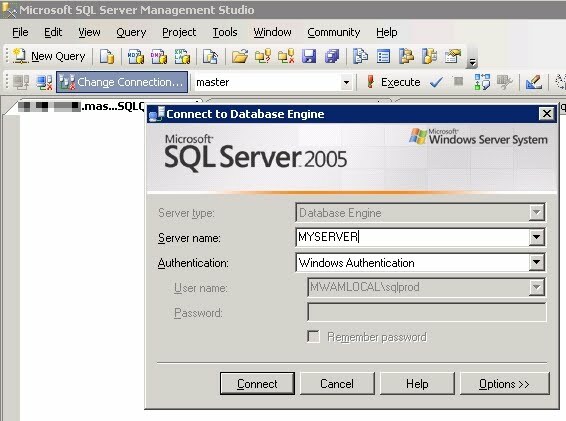 Fed up having to click the "Change Connection Icon" every time you want to change your connection in management studio, and wish there was a shortcut key you could press? Then worry no more (and try get out more often)! Right click anywhere on the tool bar, and select "Customize..." from the pop-up menu. This will open up a "Customize" window - but IGNORE THIS!! 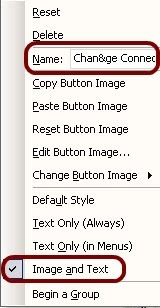 Instead, right click on the "Change Connection" icon ( ), and a customise menu will appear, specific to this icon. 1. change the position of the & in the "Name:" section - whichever letter the & is immediately before will become the shortcut key you use. Note that some keys may already be assigned (e.g. ALT-H opens the Help menu, and C opens the Community menu) - but you could change those in the same way. Now hit close on the "Customize" window that I told you to ignore earlier, and give it a try. Job done - you can thank me later! 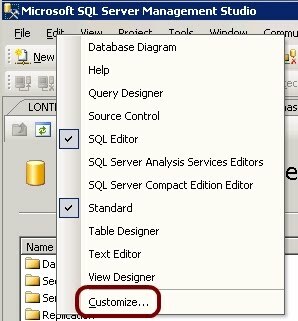 In SQL 2012, you can access this option via the Customize Menu. Right click on the menu banner, and select "Customize"
Click on the "Commands" tab. 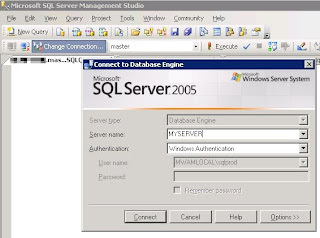 Click on the radio button next to "Toolbar", then scroll through the list to select "SQL Editor"
Now you can click on the "Change Connection" control, Once highlighted, click on "Modify Selection" over on the right, and set it to "Image and Text", and place the & symbol infront of whatever ALT-KEY you want. Nice for other commands like SQLCMD mode as well. AMAZING!! I've been looking for this for AGES! Great update from Chadwick for SSMS 2012 - thanks. I love you and I want you to have my babies.